Model5 offers the best input selection, volume control, and balance control function. Model5 is a preamplifier without an amplification function. Volume and balance control are performed by selecting a fixed register with 23 point-of-contact rotary switch. 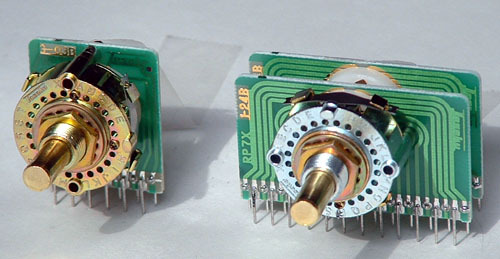 A music signal passes only two fixed registers in every position of volume and balance control. This brief structure makes degradation of sound quality the minimum. 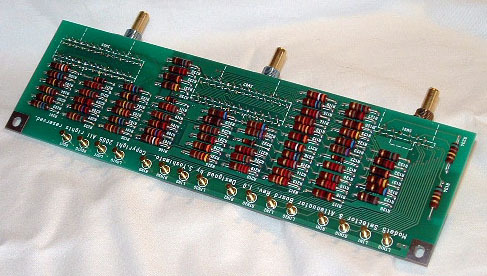 The photograph is a circuit board of Model5 with which many resistors were located. 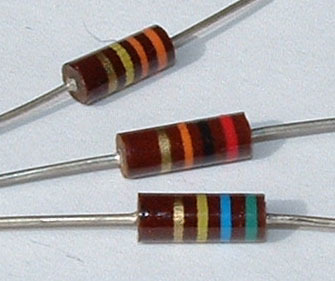 A music signal passes along two only of the selected resistors in these. 3-Line selector switch allows level control for multiple sources. Input selection, volume control, and balance control are using the quality gold point double contact type rotary switch for a measuring instrument and industrial apparatus. The rights of a photograph are 23 point-of-contact type for volume and balance control, and 3 point-of-contact type for input selection in the left. There is the special feature of sound quality in a resistor. In Model5, you can choose a resistor from a metal film resistor and a carbon composition resistor. It is a metal film resistor of 1% accuracy 0.5W type. This resistor has wide-range and high resolution sound quality. 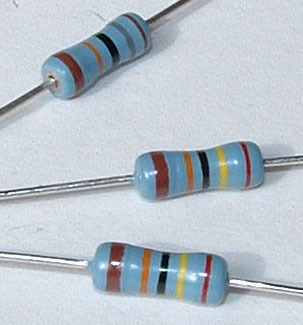 It is a carbon solid resistor of 5% accuracy 0.5W type. This resistor has rich mid-low and charming sound quality. High quality parts are used for Model5. gold plated RCA jacks, the strongly structure chassis etc.. Please look at Model5 technical description about an internal photograph, a circuit diagram, and detailed description. You can enjoy the pure sound quality, the outstanding feeling of operation, high reliability in low cost. The input impedance of channel which falls volume using balance adjustment goes up to about 200K ohms at the maximum. The input impedance of channel which volume goes up on the contrary does not change.